It’s not uncommon to miss the company of animals when travelling. But a severe case of “dogsickness” changed the career direction of forest scientist Cynthia (Cindy) Karsten. “I went to work in Montana with the AmeriCorps program Montana Conservation Corps, travelled a lot with the job and couldn’t have a dog,” she said. “Thus I started volunteering at the local shelter”. Karsten and her partner (now husband) moved to Alaska to work as bike guides, but she continued to be involved with homeless animals. Karsten spent the next two years working at a veterinary specialist clinic while volunteering with a rescue group. In 2006, she was accepted into veterinary school in Madison, Wisconsin. 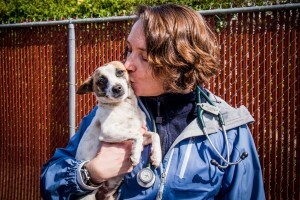 Fast forward almost a decade and Cindy Karsten, DVM, is one of a growing number of veterinarians specialising in Shelter Medicine. In June 2014, the American Veterinary Medical Association granted provisional recognition to the Shelter Medicine Practice specialty within the American Board of Veterinary Practitioners. Karsten’s path has involved taking shelter-focused externships in the fourth year of her veterinary program, working at the Dane County Humane Society during her studies, and completing a one year combined small animal-shelter medicine internship through Colorado State University and Denver Dumb Friends League. Following that she completed a three year shelter medicine residency at UC Davis. She is currently the LazinAlive Outreach Veterinarian for the University of California – Davis Koret Shelter Medicine Program (part of the Centre for Companion Animal Health t the School of Veterinary Medicine). She is often asked why we need vets who specialise in shelter medicine. Infectious diseases are always a concern when dealing with a population of animals. In dogs, the main concerns are canine infectious respiratory disease syndrome (CIRDS) and parvovirus. For cats in shelters, the most common infectious disease threats are upper respiratory tract infection, panleukopenia and ringworm. Like all vets, shelter medicine specialists solve problems, but are required to do so on a broader scale. 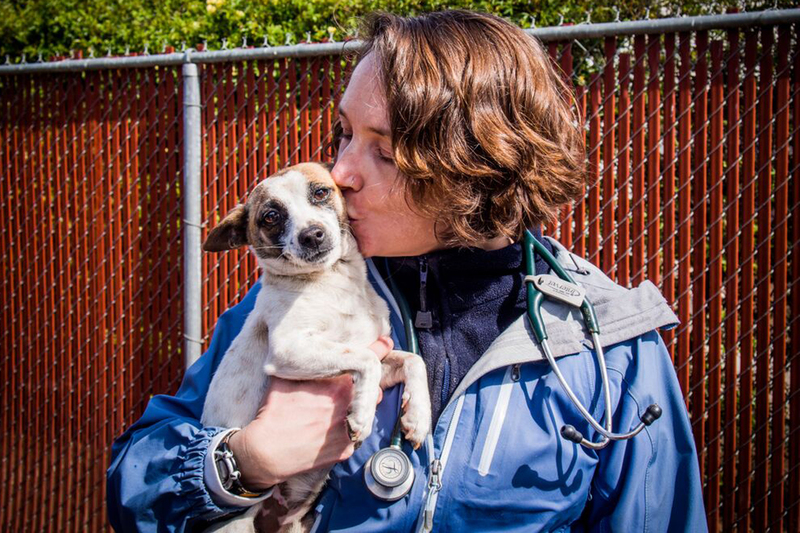 Karsten performs consultations, but instead of examining a single animal, her patient is the shelter. “A consultation can be focused, for example looking at one aspect such as population management or controlling an outbreak, or comprehensive,” she said. She takes a history, which can be time consuming as it requires looking at data from previous years where this is available. Karsten is particularly interested in animal intake, outcomes and length of stay. Shelter management is evolving. One of the most significant changes Karsten has seen is a trend toward working from a shelter’s capacity for care, rather than defining capacity as the number of housing units that a shelter has. “Much is this is from drastically changing how the shelter manages cats – either from discontinuing the intake of healthy stray cats or if the shelter does take them, returning to field either those that are not suitable for life in a home or all cats above the number that the shelter can adopt out,” she said. Karsten believes shelters must determine and function within their capacity for care – how many animals are they able to take care of, ensuring that all animals enjoy the five freedoms and ideally a sixth: freedom from euthanasia for animals that are neither suffering irredeemably nor dangerous. Clearly, cats are a sticking point. “Each year, millions of cats lose their lives in animal shelters. An enormous amount is invested in the capture, holding, and euthanasia of these animals, and the emotional toll exacted by their death is incalculable,” Karsten said. Karsten mentions the Million Cat Challenge, a North American shelter-based program that shelters can voluntarily participate in. 1. Providing alternative to intake – to keep cats in the home or community when admission to a shelter is not the best choice. 2. Managed admission – intake of cats is scheduled to match the shelter’s ability to assure humane care and safe movement through the system to an appropriate outcome. 3. Capacity for care: Match the number of cats cared for at any one time with the capacity required to assure the Five Freedoms for all shelter cats. 4. Removing barriers to adoption: Expand the pool of adopters by addressing factors such as cost, process, or location. 5. Return to field: Desex, vaccinate, and return healthy un-owned shelter cats to the location of origin as an alternative to euthanasia. “Not every initiative will make sense for every shelter, and there is no need to embrace all five initiatives to participate,” Karsten said. “The “Million” of the Million Cat Challenge will be based on aggregate numerical reduction in euthanasia and increase in lives saved by the participating shelters”. The release of cats back into the community will be controversial to some, but the plan is based on the observation that removal +/- euthanasia could increase the numbers of new cats moving into an area if the resources continue to be there. Inevitably, working in shelters, Karsten has fostered and adopted more than her fair share of charges. She has a soft spot for small dogs. “We live with Milly – an ancient long haired Chihuahua mix who I adopted during my internship as a hospice dog – she was having seizures at the shelter, and they aged her at about nine or ten at the time. She was going to be euthanised. I just couldn’t bear that her last day would be at the shelter after she’d been there almost 6 months so I decided to take her home to live out whatever time she had left”. In her free time, Karsten rescues small dogs from Fresno who fly to Minneapolis where there is a shortage of small dogs for adoption. She works with a rescue group who does this every six weeks. To date they have saved over 700 dogs. This is how she met Neil and Hailey. “Both were shy and so we fostered them, but just couldn’t put them up for adoption. Neil is really truly the best dog in the world and Hailey has become his best friend. We also have Rodger – a toothless older Chihuahua who is not very bright but provides lots of entertainment and comic relief. I met him when I was visiting a local shelter last fall and in a moment of weakness said I’d take him home”. But it’s not all about small dogs. There’s also Mi’ja – a 20kg collie mix. “We have one cat, Blue – he showed up at a friend of a friend’s house about 9 years ago – we’d been thinking about getting a cat and so said we’d try him at our house to see how he did with all of the dogs. He fit in swimmingly immediately so he stayed. I’m pretty sure he thinks he’s a dog”. Karsten is optimistic about the future of shelter medicine.